As parents, it could be such a challenging time to find the right kind of toys for our kids. We have to consider if the toys are safe for them to play with, especially for younger children, because you need to follow extra measures to ensure their safety. If you over-prioritize safety, however, you might get stuck with a toy that your kids won’t be able to enjoy at all. You must always find a middle ground between your child’s safety and the level of entertainment that they could get from their toys. Really, it is easier said than done. There are a number of tips that you can find online for more in-depth information about this before taking the next step. One classic toy that we’re sure all kids will love is none other than a good, old-fashioned train set. We can still remember how as little kids we’d be fascinated during train rides and how victorious we felt when our own parents or grandparents got us our first train set. We can still remember how excited we were while unboxing it but not as much as when we start assembling it, connecting pieces and beginning to see the whole set make sense. From then on, we’d spend hours playing with them with our friends and siblings. Of course, we want our kids to have the same kind of experience. Train sets are excellent for encouraging our children to be more creative and imaginative. Here at ParentsNeed HQ, we want to make sure that our children are happy and safe. We want to help parents like us to pick out the best toys that will make our children’s playtime more fun and exciting. This is why we came up with our very own list of top 5 best train sets for kids: tried and tested, and with our seal of approval. KidKraft ranks first in our quest to find the best train sets for your child. On the surface, it may look like your typical train set but careful inspection will tell you that these toys were made with the child in mind. It has bright colors and soft, rounded edges guaranteed to make sure your children are safe while playing it. KidKraft has stood out in the business of making train sets mainly because their toys are sturdy and have stood the test of time. One of the best parts about this particular train set is that it includes a nice little table where you can place the train set. The tabletop is designed specifically for the train set and it just looks too cute when it is fully assembled – it’s like having your own little city, with its mountain tunnels and rotating track switch. Note that the tabletop is reversible. Just flip it for a blank slate if you have other plans for the set’s landscape. Or, you can also use this table for your Friday night board games with your family. The table edge is raised just a bit higher to help keep the toys in place. Its size is perfect for up to 4 children to play in. That means it’s perfect if you are in a bigger family or if you enjoy conducting playdates at your house. The edges are also T-molded, which is perfect in preventing chipping. Included in the package are three red plastic bins that’s perfect for storing toys. They slide perfectly under the table so you don’t have to worry about finding a place to store the pieces of this train set. The box contains a total of 120 pieces, which include trees, buildings, townspeople, tracks, signposts, bridges, and many more. The tracks are made of solid wood so you don’t have to worry if your kids get a bit rough at playing them. You’ll also like the fact that you can use popular toy trains like Chuggington and Thomas the Tank Engine on this train set. Next up, we have the Deluxe Railway Set from Brio. Your kids are sure to enjoy this set as much as the top choice. The only reason this placed second on our list is that it’s much more expensive compared to KidKraft train sets and it has fewer pieces – 87. What makes this train set fun to play with, despite having fewer pieces? Lights and sounds. That’s right, your kids can have a closer-to-reality train experience with this set, batteries included. Also, with Brio – one of the best names in quality toys – you can’t really go wrong. This train set can provide a more integral experience to your child with its bright-colored pieces. Some of the trains are even designed to look more modern than the others, giving a variety of sorts to the overall experience of your children. Also, we love that the packaging can already double as a toy storage bin for the train set and your kids’ other toys. It’s true, it doesn’t come with a table like the KidKraft train sets but you can just as easily set it up on the floor or even on a coffee table. 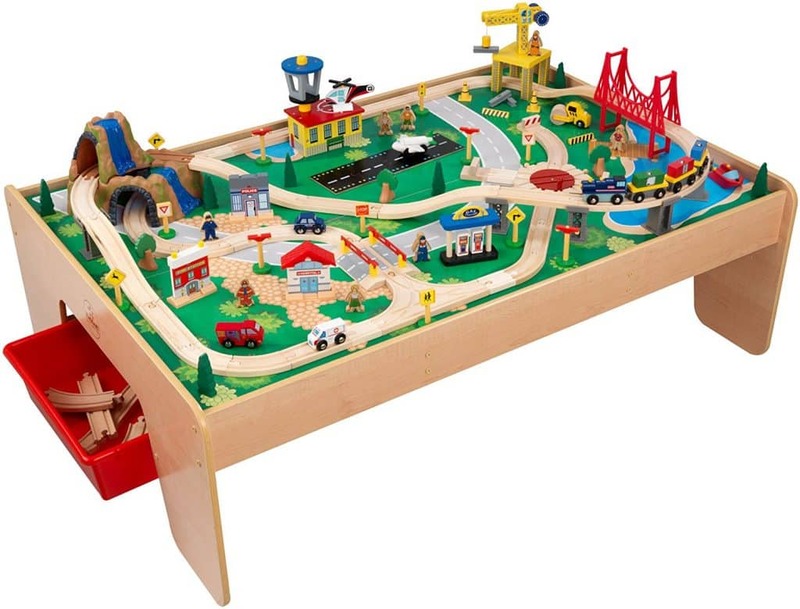 Alternatively, you can buy one of Brio’s tables that are made specifically for their train sets for kids. Speaking of buying, their train sets are expandable, so you can buy as many expansion packs as you and your kids want and have endless fun with them. The design is also smart and well-thought-out. The pieces go so well together and we can’t help but want to play with these train sets ourselves (when our kids aren’t watching, of course). What can we say? We loved it the moment we saw it. It is a bit pricey but it’s definitely worth it. You’ll definitely see, once you get this train set, where all those extra bucks went, and you’ll appreciate it even more. Melissa & Doug is a household name when it comes to toys, which is why it shouldn’t come as a surprise that they continuously appear on list of the best toys for children. From a humble beginning, Melissa & Doug as a brand has proven that they always make sure that their toys are made with the children in mind. With careful design and high standards of safety and quality, it’s no wonder why they’ve managed to land the third spot in our list of the best train sets for kids. If you’re new to their brand, though, read on and we’re sure you’ll be as convinced as us. To start with, one of the things we love about this train set is its simplicity. It’s not too flashy, nothing extravagant. It’s very straightforward and unintimidating. You see what works and what doesn’t. That itself is already a reason to get this train set. With all the fancy train sets in the market right now, there’s something to be admired with the simpler ones. For one, there’s a lot of room for customizability. You can design it pretty much however your child pleases. It’s also not space-consuming and it goes without saying that it’s easier to store – no bulky pieces for you to worry about. This 100-piece train set comes with over 30 accessories such as bridges, cranes, trees, and townspeople – all of which have child-friendly designs. They are brightly colored and smooth to the touch. The tracks can be configured in four different ways, and you can work on them with your kids by following the manual that comes with it – very easy to understand. It has a freight train, a passenger train, and a flatbed truck with cargo. All pieces are sturdy and perfect for kids who, let’s be honest here, sometimes tend to fight over their favorite pieces. “It’s time to take back childhood,” is Melissa & Doug’s catchphrases and with this cute little train set, your kids are bound to do just that. Did someone say triple-loop? Well, you know what we say about train sets: more loops means more fun. Kidding aside, Orbrium takes the fourth spot in our search for the best train sets for kids. It’s not as fancy-looking as the earlier entries on this list but it doesn’t mean your kids won’t appreciate this adorable train set. Your kids will also get more free rein with this piece because of its simplicity, same as Melissa & Doug’s entry on this list. It is quite simple on the surface but its design and durability have both made it a favorite among parents. The pieces are colored beautifully and we love the details on each of them. You have buildings, cars, signposts, townspeople, and trees. They’re made from beech wood and are actually quite smooth to the touch. You don’t have to worry about splinters. You can easily lay out the entire set on your kids’ playroom or on a large table. Aside from that, this set is also open for expansion so you can just as easily buy additional tracks to make it bigger. The company has also made sure that it is compatible with the popular toy trains and Brio tracks. If you want to increase the size of this train set or use your kid’s existing favorite toy trains, you’ll be able to manage that without any problems. For sure, your kids will spend a lot of time trying to figure out how set this up. As parents, we also enjoy watching our kids come up with their own creative interpretations of how train tracks should be arranged and that’s not even quarter of the fun you’ll get with this child-friendly train set. Enjoy assembling and reassembling this set however you and your kids please and play for hours on end. We have come to the end of our list and we’ve saved the fifth spot for Kids Destiny’s 100-piece triple loop train set. We know you’re already sensing a pattern here because our last three entries are much plainer compared to the first two entries. While we do prioritize the quality of the toys, we at ParentsNeed HQ also believe that the best toys encourage kids to create, much like how encouraging them to read at a young age opens doors for them. That’s exactly what all our entries are good for. Kids Destiny has also achieved this with this particular train set. Built to meet the CPSC’s standards, you need not worry about your child’s safety when playing with this train set. It has vivid colors and made out of beech wood – sturdy material that has proven to be an excellent choice for kids’ wooden toys. The paint is also not lead-based and it doesn’t chip off of the wooden pieces. Additionally, you’ll see that the pieces fit perfectly with each other and are compatible with other brands of tracks and popular toy trains. Another thing that we love about this train set is its affordability. That’s right, your kids can enjoy hours playing with this thing and it wouldn’t put a dent on your wallet. It is one of the most affordable train sets that you could ever find and mind you, it doesn’t at all sacrifice quality for its price. Believe us when we say that you’re going to wonder why it’s so affordable. It’s quite easy to get carried in expanding your kids’ train set when you know you’re not really spending that much money for it. For a starter set, this is a fantastic toy. Your kids will be left wanting more out of this wooden train set. Whether you love train sets or not, there’s no denying that there are benefits to letting your kids try them out. They have a high entertainment value and your kids can get carried away with creating and recreating their own mini worlds with their train tracks. Aside from that, you know that this is a great opportunity to have an activity that you and your kids share with each other, which serves as a fun and entertaining means to bond with them.